THE DEATH OF THE BAKKEN FIELD HAS BEGUN: Big Trouble For The U.S. The Death of the Great Bakken Oil Field has begun and very few Americans understand the significance. Just a few years ago, the U.S. Energy Industry and Mainstream media were gloating that the United States was on its way to "Energy Independence." Unfortunately for most Americans, they believed the hype and are now back to driving BIG SUV's and trucks that get lousy fuel mileage. And why not? Americans now think the price of gasoline will continue to decline because the U.S. oil industry is able to produce its "supposed" massive shale oil reserves for a fraction of the cost, due to the new wonders of technological improvement. The mighty Bakken oil field located in North Dakota reached peak production in December 2014 at 1.26 million barrels per day (mbd) and is now down to 942,000 bd. This decline is no surprise to me or to my readers who have been following my work for the past several years. 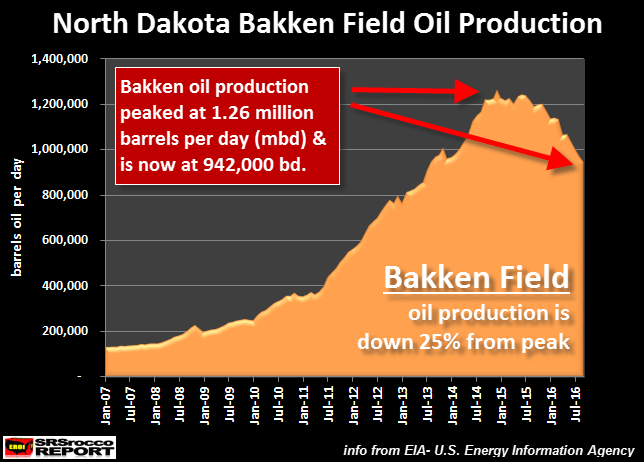 There are only so many drilling locations available and once they run out, the Great Bakken Field will become a BUST as the high decline rates will push overall oil production down the very same way it came up. Those who moved to the frigid state of North Dakota with Dollar signs in their eyes and images of sugar-plums dancing in their heads will realize firsthand the negative ramifications of all BOOM & BUST cycles. Unfortunately by April 2015 it was clear that the oil markets were in a secular decline brought on by oversupply in the global energy markets fueled by a deep recession in China. As a result, companies started to lay off workers, and over the following months caused a massive exodus of people as jobs were eliminated. Nobody is exactly sure how many people have left the state, but some put estimates as high as 25,000. The strongest real estate market continues to be Watford City with the weakest in Minot. However, even in Watford City the price of a three-bedroom rental home has come down from $2,500 in 2015 to a current price of $1,400. This represents a 44 percent decline of the rental price in the market. 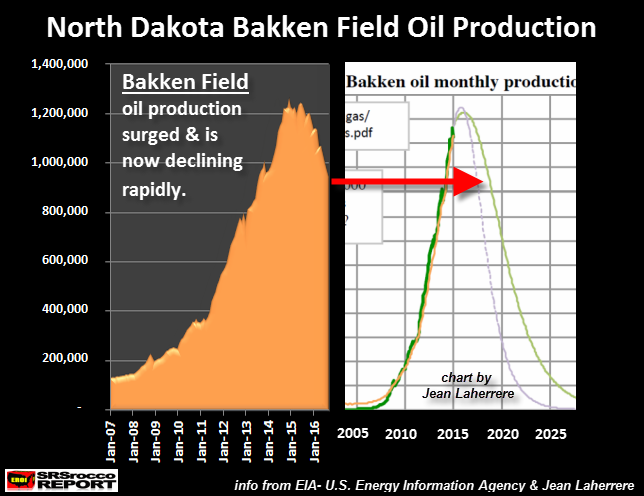 As we can see in the chart above, the rise and fall of Bakken oil production is very close to what Jean Laherrere forecasted several years ago (shown by the red arrow). According to Laherrere's chart, the Bakken will be producing a lot less oil by 2020 and very little by 2025. This would also be true for the Eagle Ford Field in Texas. According to the most recent EIA Drilling Productivity Report, the Eagle Ford Shale Oil Field in Texas will be producing an estimated 1,026,000 barrels of oil per day in September, down from a peak of 1,708,000 barrels per day in May 2015. 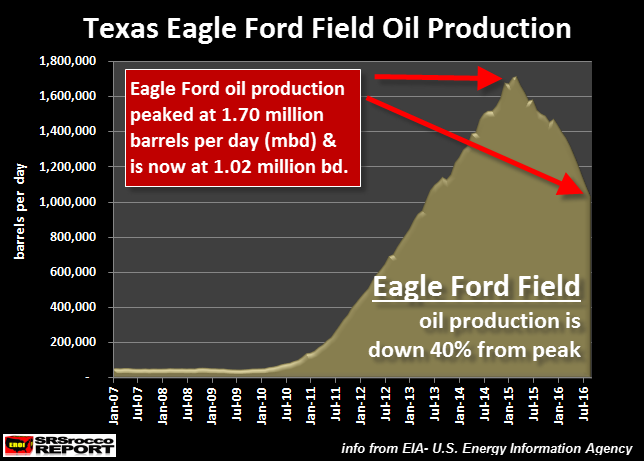 Thus, Eagle Ford oil production is slated to be down a stunning 40% since its peak last year. Do you folks see the writing on the wall here? The Bakken down 25% and the Eagle Ford down 40%. These are not subtle declines. This is much quicker than the U.S. Oil Industry or the Mainstream Media realize. And... it's much worse than that. 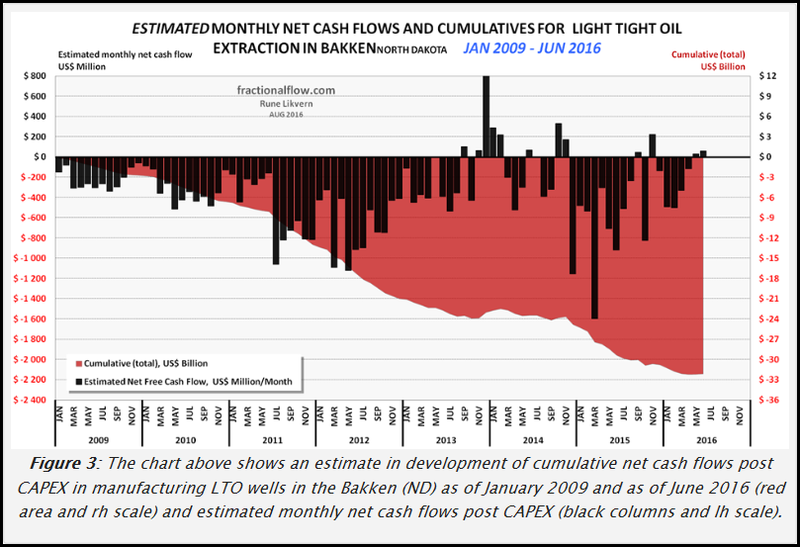 I will simply this chart by explaining that the BLACK BARS are estimates of the monthly Free Cash flow from producing oil in the Bakken since 2009, while the RED AREA is the cumulative negative free cash flow. As we can see there are very few black bars that are positive. Most are negative, heading lower. Furthermore, the red area shows that the approximate negative free cash flow (deducting CAPEX- capital expenditures) is $32 billion. So, with all the effort and high oil prices from 2011-2014 (first half of 2014), the energy companies producing shale oil in the Bakken are in the hole for $32 billion. Well done.... hat's off to the new wonderful fracking technology. Just to retire estimated total debts (about $36 Billion, including costs for DUCs, SDWs, excluding hedges and income/loss of natural gas and NGLs) would require about 7 years with extraction and prices at Jun-16 levels. Nominally to retire all debts (reach payout) would take an (average) future oil price close to $65/bo (WTI) for all the wells in operation as of end June – 16. This is without making any profit. For the wells in production as per Jun-16, the total extraction of these will decline about 40% by Jun-17, and depletes their remaining reserves with about 20%. By assuming the operations remain cash flow neutral, total debt remains at $36 B in Jun-17. As from Jul-17 this would now require an average oil price of about $73/bo (WTI) for these wells to nominally retire all debts (reach payout). Additional wells will add to what price is required to retire the total debt. What Rune is stating here is that the $36 billion in total cumulative debt will occur by June 2017. Thus, it would take an average $65 a barrel to just pay back the debt in seven years. With the way things are going in the U.S. and world economies, I doubt we are going to see much higher oil prices. Furthermore, the work by Louis Arnoux and the Hills Group suggest the price of oil will fall, not rise due to a Thermodynamic Collapse. More about this in an upcoming interview. As I have been documenting in previous articles (going back until 2013) the U.S. Shale Oil Industry was a house-of-cards. Readers who have been following my work, based on intelligent work of others, understood that Shale Oil is just another Ponzi Scheme in a long list of Ponzi Schemes. From time to time, I look around different websites that publish my work and read some of the comments. I am surprised how many individuals still don't believe in Peak Oil even though I explained the Falling EROI - Energy Returned On Investment quite clearly. For some strange reason, some individuals cannot use deductive reasoning to destroy lousy conspiracy theories. Moreover, if they do believe in Peak Oil, then they think there is a wonderful "Silver-Bullet Energy Technology" that will save us all. I gather they believe this because the REALITY and IMPLICATIONS of Peak Oil are just too horrible, to say the least. So, holding onto HOPE that something will save us, just in the nick of time, is better than accepting the awful reality heading our way. And the awful reality of Peak Oil will be felt more by Americans as their lifestyles have been highly elevated by the ability to extract wealth and resources from other countries through the issuing of massive amounts of paper Dollars and debt. Basically, they work, and we eat. 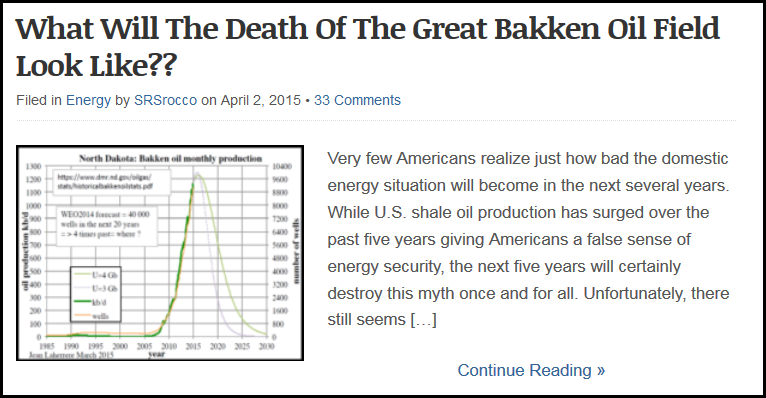 Unfortunately, the propping up of the U.S. market by the Fed and the domestic shale energy Ponzi scheme is running out of time. This is why it is imperative for investors to start moving out of Bonds, Stocks and Real Estate and into physical gold and silver to protect wealth. For the wealthy investor or institution that believe a 5-10% allocation in physical gold is good insurance, you are sadly mistaken. While Donald Trump is receiving more support from Americans in his Presidential race, his campaign motto that he will "Make American Strong Again", will never happen. The America we once knew is over. There just isn't the available High EROI - Energy Returned On Investment energy supplies to allow us to continue the same lifestyle we enjoyed in the past. So, now we have to transition to a different more local or regional way of living. This new living arrangement will be based on capital that is "STORED ECONOMIC ENERGY or WEALTH." This can only come via the best sources such as physical gold and silver. If individuals and countries have been acquiring physical gold and silver, they will be in better shape and will be able to enjoy more options than those who have been selling their gold and accumulating lots of debt and derivatives.